Monsters University was originally released on blu-ray in November, 2013. Jeff and George reviewed this title on Communicore Weekly during its original release. George: Pixar’s been on a winning streak since Toy Story. Critics and fans alike question how long Pixar can keep cranking out the hits. Monsters’ Inc has always been a favorite in our house, because it’s been the film that seemed to elevate Pixar character animation to the next step. There was a believability and honesty with the characters that we hadn’t seen before. When I first heard about a Monsters prequel, I wasn’t sure what to expect. Would Monsters University live up to the hype? Jeff: Monsters Inc is definitely in my top two Pixar films, so like George, hearing they were making a prequel made me a little uneasy. Prequels are always tricky ground and don’t always turn out well (coughStarWarscough). Though, I was still excited to see it. Unfortunately, Monsters University came out the same time that I moved cross country, so I missed it while it was in theaters. George: (Hangs head in shame.) We missed it in the theaters, too, so I was excited to get the review copy. We watched it the first weekend and I’ve spent the rest of the week watching the extras. 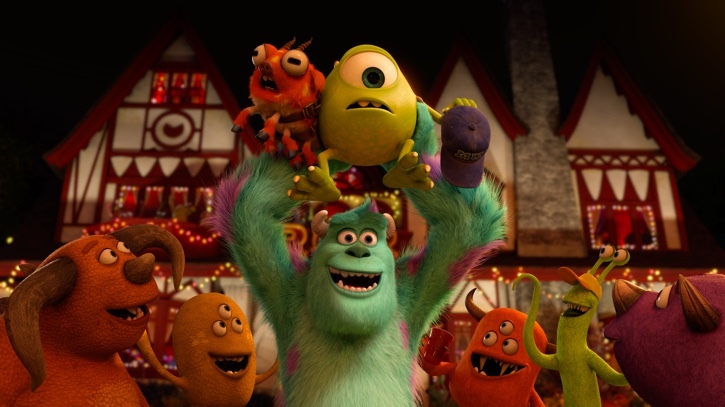 I enjoyed the film and thought it was a great Pixar film and a good addition to the Monsters universe. The characters were still incredibly well-defined and even when Pixar brought in more of a stereotype character, it still fit into the film extremely well. I did miss Boo but seeing the development of friendships and rivalries kept the story going and kept us cheering for Mike. Jeff: I really like how the story itself focuses on Mike, from how he initially grew up wanting to be a Scarer, and how his friendship with Sulley formed. I found the film to be extremely charming and it had quite a few moments that made me laugh out loud. 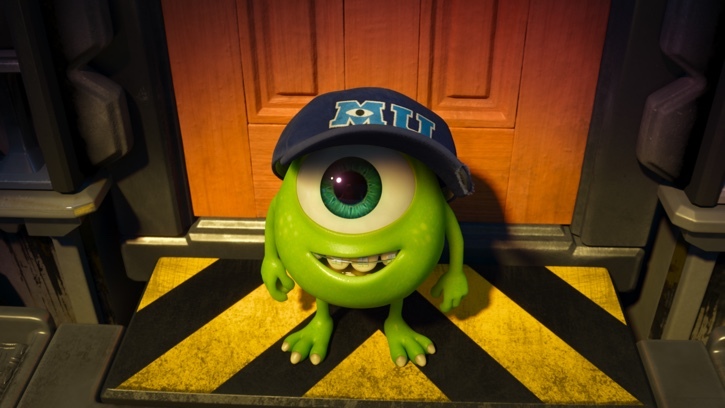 Like George said, it really felt perfect for the Monster’s universe, and it made sense, filling in the blanks before Monsters Inc.
“MONSTERS UNIVERSITY” (Pictured) YOUNG MIKE. ©2013 Disney•Pixar. All Rights Reserved. George: What’s funny is I didn’t know there were blanks until I saw this film! To me, Pixar really did a great job of using the college experience as a character. Most everyone is going to be able to relate to the film whether they went to college of have seen the many films about college life (Animal House, anyone?). Jeff and I are always concerned about the special features when there’s a blu-ray release. We’ve seen a dearth of special features on recent releases and hoped for the best with Monsters University. We’re both happy to say that there’s good news. Jeff: I have to say, the amount of special features, and the depth that they go, was a pleasant surprise for this disc. I was concerned at first, after viewing the film, and seeing that the only special feature on the disc was audio commentary. It then took me a moment to realize that there was a whole other, second disc, devoted completely to special features. The inner film nerd in me cried out in joy. Every single featurette in the special features was fantastic to watch. My personal favorite was “Campus Life,” a day in the life of making the film. ARE WE HAVING FUN YET? – When it comes to college life, Mike and Sulley have VERY different ideas of what it means to have a good time—it’s a wonder these two mismatched monsters ever settled their differences. Directed by Dan Scanlon and produced by Kori Rae, “Monsters University” scares up audiences on June 21, 2013, and will be shown in Disney Digital 3D™ in select theaters. ©2012 Disney•Pixar. All Rights Reserved. What do you think about Monsters University? Which Pixar movie is your favorite?